Fenway Sleeps. Bring the Memories. The snow isn’t on the Fenway infield quite yet but I am already thinking about what this season has been and has meant. In late March, my cerebral friend and über Sox fan, Marc Wise, predicted about 75 wins for a very broken team coming off the sarcastic rule of Valentine. Late in game 6 of the just concluded World Series, Marc tucked his new baby boy into his crib and sat back down to watch his team close out the Cardinals for the championship. Marc is rich indeed. On April 1, when the Sox opened the season in the Bronx, I took the Metro North train from New Haven to new Yankee Stadium. It was supposed to be an easy, streamlined in-and-out of NYC trip. But it is still a cold, dirty amble to an overbuilt, impersonal concrete slab of a ballpark. Greed rules. The historic bones of a baseball shrine have been scattered. Thank God we still have Fenway and Wrigley. Speaking of opening day, Dustin Pedroia tore a thumb tendon sliding head first into 1st base that day. He played injured all year. He managed to register .301, 9, 84, with 91 runs scored, playing in 160 games and leading the AL with 724 plate appearances…and won his second gold glove. I pray that the little man stays healthy another 7 or 8 years. Then we’ll see about Cooperstown. The 2013 team threw dirt on the grave of the 2011 team and its legendary, gut wrenching collapse. Beneath the surface of that soil lies the sadness surrounding Terry Francona’s departure and the bitter bile of Bobby Valentine’s hubris. All is forgiven now. I wish Tito good luck, and the same to Valentine’s bosses at Sacred Heart University. 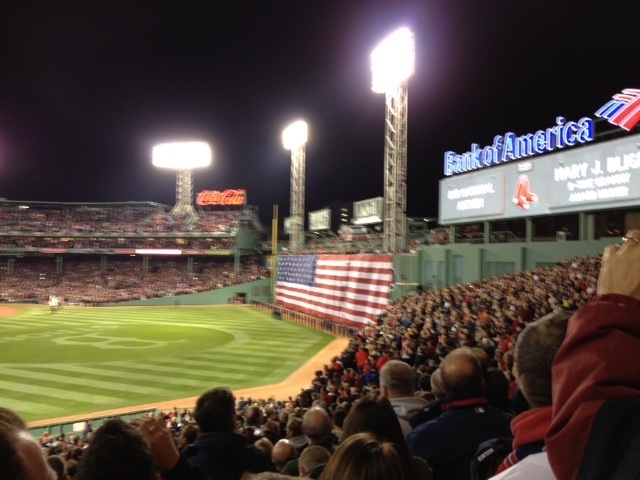 I was at Fenway on Opening Day, when Buchholz was brilliant and Daniel Nava, the player nobody wanted, hit a 3 run HR in the 7th to post a 3-1 win. I was there on Patriots Day, when Napoli’s 9th inning wall ball double won it, 3-2, 90 or so minutes before two twisted boys detonated bombs near the finish line of the Marathon. The T ride out of the city was somber. Strangers looked each in the eyes and talked softly about what needed to be done. David Ortiz’s unfortunate F Bomb on April 16 before the Fenway crowd, and a seemingly total lack of disapproval for it. The leaving of Jose Iglesias, whose speed and fielding I adored. The coming of Xander Boegarts, who I saw hit a laser out of Hadlock Field in 2011, and who wears the “next great” tag. The hard-to-watch on-camera awkwardness of Erin Andrews on the World Series broadcasts on Fox. Heidi Watney is tip top and Rachel Nichols is almost as good as Heidi as an on-field reporter. Andrews’ queerish self-awareness and odd interview questions make her a square peg in a round hole. I can’t believe Fox prefers her to the others. Fox broadcasters made a shallow & disconnected attempt to get a charge out of this championship being the first won in Boston since 1918. It was an attempt to recall and reignite the emotional relief New England felt in 2004 when an 86 year drought ended. It wasn’t the same. It was poorly scripted. The presence of Jonny Gomes, John Lester and others in Gillette Stadium for the Nov. 3 Pats vs. Steelers game was a master stroke, as was the observance at the Marathon finish line made the day before by the parading duck boats. Fair thee well, Jacoby and Salty. I’ll be rooting for you unless you put on pinstripes. Congrats, Ben Cherrington. Perhaps it was you who worked the magic that Theo got credit for in 2007. Thanks again Larry. I owe you. Three times now. This entry was posted on November 4, 2013 at 1:32 pm	and is filed under BASEBALL. You can follow any responses to this entry through the RSS 2.0 feed. You can leave a response, or trackback from your own site.